On Wednesday afternoon, I took a field trip to East London with my British sociology class. My eccentric professor explained fascinating details about the particular area we were in. This extremely impoverished borough of Tower Hamlets was quite a jump from the Kensington streets I walk everyday in West London. While Tower Hamlets is one of the most deprived communities in the city, it is also home to a very large corporate district that includes most of London’s tallest and most modern buildings. The contrast between poverty and corporate might was shocking to observe from a single location. This was a very eye-opening experience for me, and it was good to see another side of this vast city I call home (for now). On Friday, I went on my first official shopping outing. We ventured to Oxford Street, Europe’s busiest shopping destination with approximately 300 shops. “Busy” in this case is an understatement. I think I almost died in Primark due to the outrageous number of people pushing their way through the crowds – grabbing sweaters, jackets, shoes, purses, even home décor – on a quest to satisfy their shopping fix. Primark is famous for its wonderfully cheap fashion and notoriously stressful shopping experience. All in all, the trip was a success. My most exciting purchase was a new pair of boots for Dorothy Perkins. Ever since arriving in London, I had been waiting carefully to stumble upon the perfect pair. This fabulous find was certainly worth the wait. On Saturday, I woke up early for coffee and porridge at Starbucks and got down to some serious homework. After dinner at Hyde Park (again, it’s the best) I ventured out on my first solo, late night tube adventure. A friend, Sacred Heart sister, Omaha native, and fellow study abroad comrade was in London for the weekend! Meghan is currently studying abroad for the semester in Florence, Italy. She made the journey to London with her roommate Aimee, who graduated from a Sacred Heart school in St. Louis. It was so wonderful to catch up with Meghan and make a new friend. There really is nothing like meeting up with someone from home while in a foreign country; I am so, so happy that it worked out for us to meet up. On Sunday, we had big plans to visit Abbey Road. 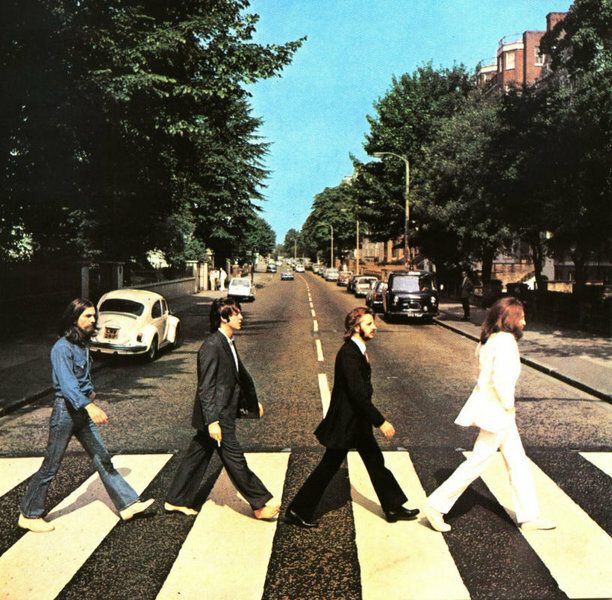 The famous London thoroughfare is home to Abbey Recording Studios where The Beatles recorded almost all of their albums and took this well-known cover shot for their last album ever. Although I can by no means claim to be a die-hard Beatles fan, I will say that the excursion was one of the most wonderful experiences I have had in London so far. We signed the wall in front of the studio and after many trials, managed to snap our own replica of the famous album shot as we crossed the street with stride. I hope everyone back home in Omaha and Des Moines is enjoying the fabulous fall weather, it’s not quite the same here in London. Can’t wait to see the boots!! They’re booties! Inspired by the one and only, Kate Richling.